What is structured data and how does it affect my website? Structured data is the standard vocabulary needed for search engines to capture and communicate essential facts and meaning from websites. This data makes it possible for search engines to display answers to user queries quickly without users visiting your site. The webmasters who use structured data don’t merely feed the search engines with content; they also tell them what that content means. Search engines show this information as enhanced results (SERPs) (rich knowledge boxes, snippets, cards, carousels, etc.). Who created structured data and why? Yahoo, Google, and Bing partnered to create a universal standard for structured data. The goal was to make the Internet better by delivering answers and content to users before they visit a website. The potential economic benefits are tremendous since people will spend less time searching and more time being productive workers. Happy search engine users equal delighted and more profitable search engines. As a result of the partnership, Schema.org was born, and so were the universal standards for structured data. By using structured data, everyone is a winner. Search engines can display more meaningful search results, and your website gets additional exposure by looking more exciting and professional. If you’re familiar with rich snippets, you’ll quickly understand what structured data is and how to use it. Search engines give rich snippets priority when ranking pages in search results because they are helpful. 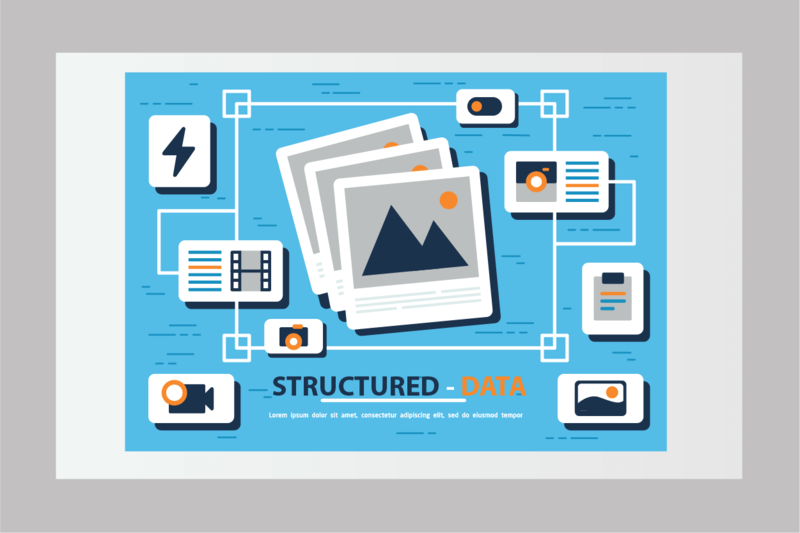 What content qualifies as structured data? Thanks to the Schema markup, almost anything can be structured. However, most search engines have focused on those items that appeal to a broad audience and are most helpful. This list includes articles, creative works, movies, events, products, restaurants, reviews, TV episodes, local businesses, and more. In fact, there are hundreds of structured data categories from which to choose. By taking the time to look through them all, you’re almost certainly going to find options for your website. Many SEO professionals share the opinion that schema markup has some benefit for attaining better search engines rankings. Including structured data on your website will improve chances of Google showing your web pages in enhanced search engine results. Schema results in better click-through rates. It does not always translate into higher search engine ranking. In fact here is the video of Google spokesperson Matt Cutts where he clarified Google’s official position in 2012. Note that he leaves the door open to the possibility of Schema influencing page rank. With the slow adoption of Schema and the development of new technology like Google Home, one wonders if it will change. We believe it will happen in a future Google algorithm change. Evidence has not been seen to validate this is happening today. In a technical context, structured data requires inserting unique schema markup code on a website. Search engines use this to convey valuable information that users need to know from a web page. There are three ways to apply structured data by modifying the code of your website. The first most common method involves using Microdata markup. Microdata markup is open community HTML specifications that use nested structured data to define the structured data within your website’s HTML code. Web designers place this in the body or head of the HTML. Lastly, web designers can use HTML5 extensions called RDFa which are tag attributes which name properties as structured data. Similar to Microdata, web designers include RDFa in the body or head sections of your HTML. Hence the process can be learned even if you don’t know a thing about programming. But also if that sounds like biting more than you chew, some alternatives allow you to do the same thing without having to modify the code in any way manually. Is there a non-technical approach to implementing structured data? To help non-technical users implement a schema for their website Google created a Structured Data Highlighter Helper tool. We found this method to be the most user-friendly way to achieve structured data without programming. If you are new to structured data, you may want to watch Google’s YouTube video below before you continue reading. With the Structured Data Highlighter, you can highlight specific portions of your website and define what they mean without programming. For example, you are organizing an event and want to have it appear as structured data. Just highlight the relevant portions of your website, like the name of the event, the exact date, etc. The tool will automatically generate the correct markup for your site. Make sure you have access to an authenticated Search Console account. Google requires proof that you own the website before you can use the structured data highlighter helper tool. Your content management system (CMS) may also make this possible. If not, you may need help from a web designer. Proof of ownership typically involves uploading code to your website or adding a DNS record. If you are using WordPress, numerous plugins can help with this task. Once you verify ownership of your site, wait a day or so before you move on to the next step. Are you still having problems? Feel free to contact us, and we can help. Step 2) Navigate to the “Search Appearance” section and determine whether there is already any structured data markup on the site. Google provides this information in the search console, so there is no need to contact a web designer. Just open up Google Search Console and navigate your way to the Structured Data Report. The report will indicate where the errors are present and list the reasons why they are occurring. You may want to have your web designer correct the errors before moving to the next step. Step 3) Identify the different types of your content and figuring out which ones can be marked up. Google provides an essential guide to help you with determining structured data opportunities in what it calls a Search Gallery. Note that this is the information which Google is currently displaying with enhanced search results. However, Google will likely expand this to include additional categories of structured data so your best bet is to visit Schema.org where you can get the entire list of possibilities. Review Top Level and Extensions: Schema.org identifies the top-level Core vocabulary starting with a ‘Thing,’ and drills down to lower levels consisting of the following topics: action, creative work, event, intangible, medical entity, organization, person, place, product. Then narrow down the possible candidates by ruling out the ones that aren’t applicable. After finally identifying opportunities in the top-level plan, check out the ‘core plus all extensions’ list. This list will make sure you’re not missing any options. Ask Questions: You can make things easier by asking questions. For example: Is this page selling a product, announcing an event or publishing a creative work? Chances are you’ll be able to identify the correct category using one of these methods. You can also use Google to search for this particular type and take a look at some usage examples. This process may give you the right idea faster than reading through each category’s description. Step 4) Now, you’re finally ready to highlight the structured data opportunities on your website. If your site organized into subfolders and you have data in the same place, it will be easy. Google asks you to identify structured data on a few pages and uses that to determine data throughout your website. Hence you won’t need to do this for every page. For less classified sites, Google will expect you identify the structured data one page at a time. You can do this by using your mouse and cursor to select text on your page. Once you choose the content, you are prompted to indicate the data type on the right of the screen. For example, if it is an article you will need to select the title, author, date published, image, category, and rating. After you submit your results, Google will format your page’s structured data for it’s enhanced search results. The next time Google crawls your site, Google uses your markup to understand the data on your site. When using Google’s Structured Data Highlighter, you may not see the page, or information may be missing. Incomplete or missing content are common problems. Google fails to warn users that you can only tag data that is already indexed by its crawler. Wait until the material is indexed before tagging it as structured data with Google’s Structured Data Highlighter. Furthermore, The Data Highlighter can only access public pages. If Google hasn’t crawled or can’t crawl pages, such as behind a login page, the Data Highlighter won’t work. Why did Google stop recognizing structured data on my web pages? Disappearing structured data is a problem for webmasters who are continually trying to improve the slug or URL. This issue may happen if you are trying to make it more search engine friendly. By changing the URL webmasters brake the pattern used for structured data and Google can’t tag your pages properly anymore. The way the Google Data Highlighter works is as follows. You tag 4 or 5 pages, and Google records a pattern in the layout of your pages. It then applies the same structured data logic to the other pages on your website. Google uses this model for all pages having all the same URL structure. Delete the original page sets if you make changes to the way your pages display information or change your URLs. Then create a new page set to teach the Data Highlighter about the new structure of your site. The Google’s Structured Data Highlighter Helper tool has limitations. This tool is fantastic for small companies that cannot afford to pay a web designer. Unfortunately, other search engines and websites will not be able to access Google’s markup to format their search results. If you only use the Google Structured Data Highlighter helper tool, your website is at a disadvantage. Facebook or other sites won’t be able to give priority to your structured data in the same way. Therefore you may want to invest in having a web designer implement schema.org markup to the pages on your site. You can use the work you already did with Markup Helper as an example to follow. It is no surprise for Google to want to keep this information all to itself. Afterall Google wants to be the best search engine for delivering the top search results. For small businesses, the Google Structured Data Highlighter helper tool is all that’s needed. Those who want a more comprehensive approach will want to modify the pages of their website. Doing this will keep it fresh and more modern for the entire Internet community to use and share. How do I know if my programmer has implemented Structured data correctly? There is an easy way you can test if the markup was applied correctly, and it’s called the Google Structured Data Testing Tool. You can access it through the Google Search Console. Errors may come up at a later date, so continue monitoring the Structured Data Report in the Search Console. How can I help my content appear on the first page of Google as enhanced SERPs? Make sure the way you format structured data is technically correct, standards compliant and does not contain duplicates. Include only accurate information on your website. If Google shows the wrong information as enhanced results, millions may receive and make decisions on the false information. Make sure your data is as complete as possible and includes the required values. Don’t hide structured data when the user visits your website. Showing one thing in structured data and another, when someone visits the page, is a violation of Google’s rules. Don’t display content that is misleading or not representative of the main content of the page.Refer to Google for a complete list. If you are having difficulty with structured data in practice, you will want to refer to Google’s guide for using structured data. As you can see, using structured data will benefit your website in many ways we’ve discussed above. There are user-friendly free tools to help you apply schema markup to your site without coding. Don’t ignore doing this for your site as Schema is playing a significant roll in the development of new voice search technology and artificial intelligence. New hot products link Google Home, Amazon’s Alexa, Apple’s Siri will use schema to power voice search results. Therefore with the popularity of voice search growing, Schema mark up is becoming increasingly essential over the next few years. If you need help implementing structured data on your website, contact someone from our web design team, and we can help.